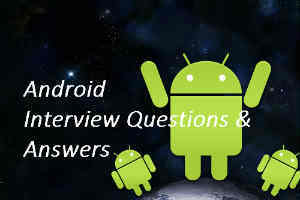 Android interview questions and answers for freshers and experienced professionals like android application developers. Android is obviously booming trend in mobile application development. This open source mobile operating system was designed by Google. There are several versions available in this Android mobile OS. This operating system was specially developed for mobile phones/smartphones and tablets. Everyone knows that the Android apps are developed using Java programming language. Here is our java program examples and java interview questions and answers guide. Feel free to go through it, before going into this Android interview guide. Why Engineering graduates are Jobless? Who can use this Android interview guide? Simple! Anyone can use this epic guide for their interviews or improving self-knowledge. Current trend students can learn about android and its development tactics. Android based jobs are better career option for freshers. Because there are less competition while comparing to the direct software field. Mobiles or tablets based android application developers can also use this guide to improve/refresh your key skills. If you are an experienced Android professional, then this guide will help you to know more. This guide has 300+ android interview questions with clear answers. It also has 20+ pages of android related explanations. This is totally based on the following contents and topics. And many more to know. Database interview questions and answers. This professionally created premium like Android interview guide is available here for NO COST basis. Obviously it is totally free for our beloved students3k visitors. Feel free to download and make use of it. Don’t forget to share about us with your friends in all social networking websites.